Review posted March 9, 2015. Random House, New York, March 2015. 599 pages. 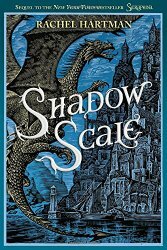 This sequel to Seraphina brings us back to the rich and detailed fantasy world where dragons take up human form. In the first book, Seraphina dealt with her heritage as a half-dragon, and in this book, she seeks to find the other half-dragons. Much of the book happens in Seraphina's mind, which at first is a little confusing, but eventually has you wrapped up in the details. My biggest complaint is that in the big final conflict scene, I'm not entirely sure what exactly happened. But I do think I got enough of it. This is a good book for those who like their fantasy complex. There was a rather neat solution to the love triangle (though I personally am not entirely happy with it. But it did work). There's war going on, and Seraphina has a role to play. But there's another half-dragon able to enter the minds of the others and then manipulate them to her own purposes. We've got intrigue and strategy combined with a virtual tour of several countries of that world. This is a wonderful follow-up fulfilling all the promise of the award-winning first book. And why did I again think there'd be a trilogy? I'm happier with this misunderstanding than I am when I mistake a quartet for a trilogy. This book did complete the story and tie up loose ends. And though it is based on Seraphina, I didn't remember all the plot details of the first book, but everything I needed to know was filled in. And the plot threads were all wrapped up at the end. An intricate and satisfying tale.